This publication really isn't a book but it certainly is a reproduction of a period publication. Although there had been some reprints of Harper's Weekly in the past, this version certainly deserves a second look. Printed on acid-free paper, it is very high quality. The large pictures demonstrate the unusually high quality of this reproduction. In the technology of the time period, pictures were produced by sending an artist to an event. After the artist made his sketches in the field, he would return and convert the sketches into a finished drawing. The drawing was then divided into pieces, each the size of an engraver's block (about the size of a 3 x 5 card). The journeymen engravers would engrave their part of the picture except for a buffer around the edge. The blocks were then gathered together and a master engraver would join all the images into a single unified picture -- it's no wonder that it sometimes took a couple of weeks to publish a picture! In examining some of the large pictures, it is possible to detect the faint hairlines that sometimes occurred when the engraver's blocks were assembled to make the larger pictures. 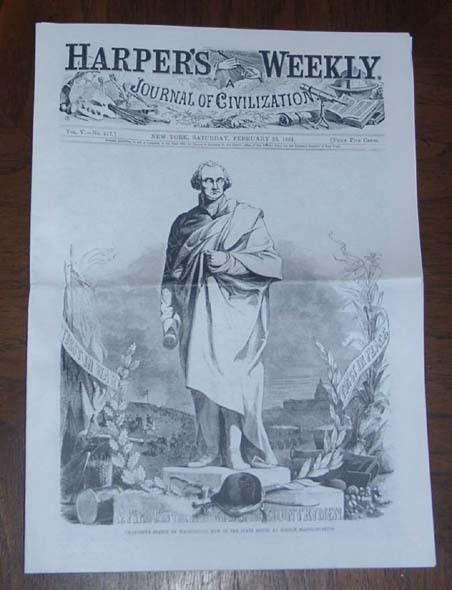 The start of the reproduction begins with the November 10, 1860, issue that announced Lincoln's election. The sequential issues conclude at the end of March 1865. After that date, there are three other issues available. The first two address the Lincoln assassination and the last, from November 1865, has pictures of Lee's surrender at Appomattox (we have no idea why they waited seven months to include these pictures). Single issues of full size reprints are $2.50 each. If you are choosing news for a particular event, there are two places to check in likely issue dates. The first is a column called "Domestic Intelligence" which is found on the right hand side of the third page of each issue. In that column are brief summaries of current events in the war. Then, about three weeks after the event, there might be a more detailed report including pictures. This delay of three weeks occurred because, during the 1860's, it took about three weeks for the process described above to be completed and the pictures appear in print. If you are uncertain whether a particular issue would contain the news you want, give us a call or send us an email and we will check what issues cover the news item. Although we have most issues (See the list of dates below. Just keep scrolling down), we may have exhausted our supply of a particular issue. We can order issues we don't have but please place your order at least three weeks before you need them to have the best probability of being able to receive them in time. For those wanting complete coverage in an attractive way to store the paper copies, we now carry boxed collections, each containing 26 issues. They are keyed on the first issue in this reproduction, i.e., November 10, 1861, so the first box covers from that date through May 4, 1861, which would include the issue for April 27, 1861, which is otherwise not available. The cost of a boxed set is $47.95. Check with us in advance to see what sets we have. Another way to obtain the newspaper is through a CD version. The CD usually contains an entire year of 52 issues, the only exception being the first CD which has several issues from the end of 1860 as well. The images for the CD were scanned at 300 dpi and the software uses Adobe Acrobat reader (which may be downloaded free here from Adobe) to view the images. The viewer is then able to view any size of the image from an entire page (a bit hard to read any of the text except the headlines) down to such a fine level of detail that the individual pixels and "jaggies" can be seen. By adjusting the field of printing, matching levels of detail from whole page to very large zoomed images can be printed with the amount that can be shown on one sheet of printout limited by the magnification employed. The cost for a CD is $24.95. Check with us for availability because the publisher is not producing these any longer. Go below the links to other books for the listing of dates we have in stock.